Sushi is a magical sort of food. Not only is sushi a great, balanced, compact meal filled with an assortment of healthy components, it also comes in such a variety of basic forms and shapes. Which is why here at Zapzapmath, mathlings are in love with sushi especially when the basic forms and shapes are supplemented with an assortment of colors and patterns. The best place to visit for sushi in the Zapzapmath ecosystem is Flying Sushi café. Run by the talented award-winning Chef Wasabi, this quaint café has an abundance of delicious sushi choices, from salmon and avocado rolls, to prawn tempura temaki, to fresh nigiri. The mathlings’ favorite is definitely Chef Wasabi’s famous onigiri, a triangle-shaped rice ball. Today, Chef Wasabi is hosting a luncheon for one of his loyal customers. He is expecting many guests to arrive very soon, and he needs your help to prepare the sushi and serve their meals! There are sushi in the shape of squares, triangles, rectangles, and circles on the menu today. Your job is to sort the sushi shapes out based on the orders that the chef provides you. For instance, if the instruction given is to collect all triangles, you find all the triangles in the pile and place them into the box on the conveyor belt. Once you have collected all the triangles, click on the green button to submit your order. If your answer is correct, the chef will ring it through to the customer. If your answer is wrong, the chef will ask you to redo the order. Either way, the Chef is happy that you are here as his special assistant! In this unit of inquiry, you will be identifying and sorting a range of basic forms and shapes. Shapes are an integral part of the learning process. Sushi Shape is an engaging game that will allow you to recognize forms and shapes by patterns. We interact with shapes on a daily basis, therefore shape recognition is a fundamental skill required in the early math development. Consistent training stimulates natural shape awareness and deciphers them into everyday environment. As you study each shape, you will build a stronger understanding of them. This is vital for learning more complex geometry concepts in the near future. Learning to identify and understand basic forms and shapes will allow you to correlate the shapes that you study with day-to-day sights and activities. 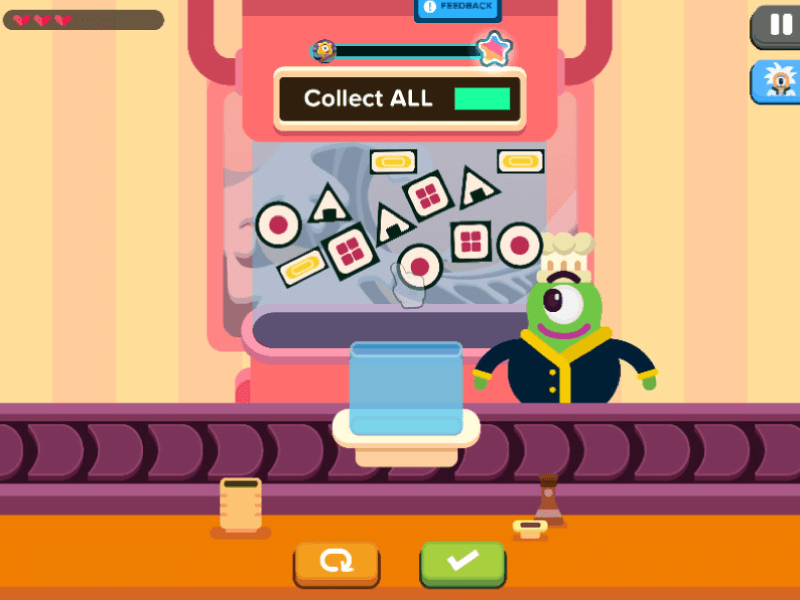 So grab your apron and start collecting; Chef Wasabi is counting on you to serve a round of the best sushi in town! Form basic shape skills with sushi!